I’m going to ask for a few improvements. Bot attacks the monsters we prioritize too late. (For example: Unique, titan, etc.) So the other players are in front of us. Can we speed up this transition? Can the Party buff tab be edited as “players closest to you”, as on the Resurrection tab? So it becomes very useful. Job Cave will benefit many users. It’s about giving the buff out of the party. Can we move the character to any part of the map by writing coordinates as in SBot? I think that’s it for now. We wish PHBot to be very useful and more useful. Bir kaç iyileştirme rica edeceğim. Bot öncelik verdiğimiz canavarlara çok geç saldırıya geçiyor. (Örneğin: Unique, titan vb.) Bu yüzden diğer oyuncular KS’de önümüze geçiyorlar. Bu geçiş sürecini hızlandırabilir miyiz? Party buff sekmesi Resurrection sekmesinde olduğu gibi “size en yakın oyuncular” olarak düzenlenebilir mi? Böylece çok kullanışlı olur. Job Cave’de bir çok kullanıcının işine yarayacaktır. Parti dışına buff verme konusunda. SBot’ta olduğu gibi koordinat yazarak karakteri haritanın herhangi bir yerine harekete geçirebiliyor muyuz? Sanırım şimdilik bu kadar. PHBot çok kullanışlı ve daha kullanışlı olması dileğiyle. @Ryan Waiting for your thoughts, you may have missed your eyes. How is this different than what it already does? It does not walk to people out of range so they are all close by. Maybe but it’s better if you change the training coords then start the bot in town. I mean, in the bot window “resurrect” tab, “players near you” list is very useful. So we can resuscitate even if the players are not at the party. 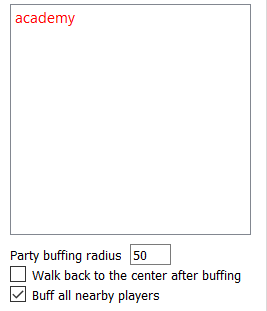 Can the same list be applied to “Party Buffing”? In this way, we can quickly access buffs to players who are not in our party. I’m using translate. That’s why I may not have been able to explain my problem. If they are not in the party it can still buff them but you must add their name to the list. I believe it is only supported for certain skills. Yeah, it’s just with certain skills. But it is very difficult to manually add names of other party members, for example when the job suit is on us. Therefore, we can not use phbot for our main character. We have to use MBot for this. And when other players come to the bot slot, phbot is slow to get the target we’ve chosen first. Again we have to use MBot. We want to work on a single bot program. A few of my friends couldn’t renew their phbot membership. Do you want it to work for only players in the party or every person that is nearby? Edit: I’ve added it but there could be some serious problems. If, for example, you have Warrior/Cleric buffs it will buff the player with Cleric buffs then switch the Warrior to put screens on the character then switch back. If you remove all Warrior weapons then it would function correctly. And if it’s a Bard/Cleric you can forget about it completely. I’ve made monster preference switching faster but I can’t easily test it. Such a problem should not occur. I’m use translate, I guess that’s why I couldn’t explain my problem exactly. 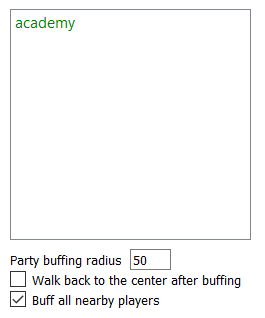 I want to: Resurrect tab in the tool --> Party Buff tab to copy. This is because, in the Resurrect tab, it is the logic of the list that we see the player names. Instead you want me to list nearby players in the window so you can easily move them? Yess! That’s exactly what I want! I’m sorry I couldn’t tell you. @NsyL bana yardım et Demek istediğimi anladıysan Ryan’a anlat. Res sekmesinde party listesine ek olarak yakındaki oyuncular da görülüyor. Party bufu sekmesindeki kutunun da aynı özellikte olmasını istiyorum. Büyük kolaylık olacak. Well I’ll just leave that useless feature in there anyway. Maybe someone will use it lol. The problem of delay in targeting and this when the problem improved; PHBot will be more preferred. This version also has the faster monster type switching but I have not tested it. Let me know if anything doesn’t work. I will use and observe. It’s supposed to? It should switch to another monster if it’s preferred more quickly now instead of killing the current mob. I did test this. I’m not talking about monster type’s. Im going to give ex.